Can you believe it? 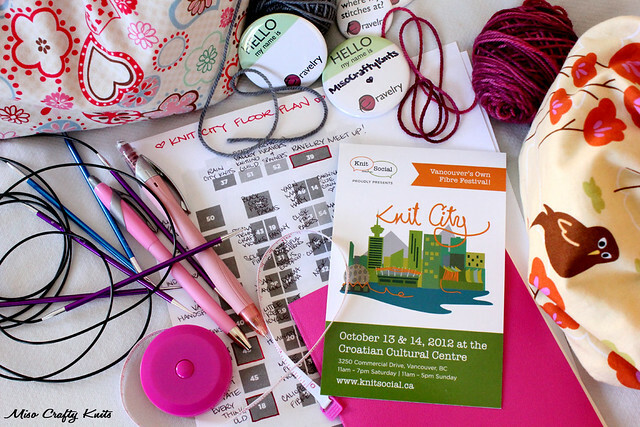 Knit City is only THREE DAYS away (If you're counting today, and I am...since it's not even 9am)!! Three!! I'm seriously getting so excited! Before, I was counting down the days. Now, I'm counting down the hours! I have less than 72 hours to get stuff done...like my Knit City cardigan. I'm still plugging away on it (I had mega issues with the neckband and now I'm having issues with the button bands) and fear that I won't have enough time to block and properly dry my cardigan (so don't be surprised if I show up wearing a slightly damp cardigan!!). I also fear that I won't have enough time or the opportunity to find buttons (so don't be surprised if I show up and my cardigan is damp and buttonless). On top of my knitting woes, I need to find the time to whip up a few project bags, find my business cards (I think I should just get new ones), sort out what knitting I should take along, and make sure I tuck my Ravelry name badge in my knitting bag. Times like these I really wish Brett didn't have to work long hours and that I had a nanny to take the Munchkin off my hands for a few hours. I was lucky that yesterday I had Brett home, and he was able to do my usual household chores and chill out with the kidlet while I silently cursed knitted away on my button bands. Boo erns that Brett has to go back to work today. I'll definitely be up late these next few nights! The past few days Amanda and Fiona, the lovely ladies of Knit Social (the company and the masterminds behind Knit City), have been releasing the list of door prizes (the ticket is included in the admission! ), a photographic hint as to what's going to be in the swag bags that will be going to the first 50 people in line on Saturday to the Marketplace, as well as giving sneak peeks of the custom Knit City merchandise that will be available exclusively at Knit City. Um, yeah...just to forewarn you all, I'm dead-set on getting my hands on a few skeins of the custom colourways dyed by SweetGeorgia Yarns (want to see what it looks like? Check it out here) and Sweet Fiber Yarns (check that one out here). So, so yummy! Don't you agree? So considered yourself warned that if you happen to get between me and those skeins of yarn, I will mow you down. Just kidding! Ok...not really. Anyhoo, this weekend is going to be so fantastic. I still can't believe that this is Vancouver's first fibre festival (Fibres West is actually in Abbotsford, not Vancouver)! I wish I could go to the Knit City Kick Off Party on Friday, but alas this mama needs to be home with the kiddo. I can't complain though, as I will be sans kidlet for 2 days. Hells yeah! Knit City is a 2-day event, and even though I'm not taking any classes, I like the idea that if I missed something on the Saturday that I could always go back on Sunday. Speaking of which, can I just say right now, ahead of time, thank you so much Knit Social for planning this event on a Saturday/Sunday!! It has always irked me when companies schedule events on a Friday/Saturday, as I generally can never make the Friday due to work and kid schedules. I'm sure I'm not the only one who feels this way. Ok, I better go get my knit on and see if I can finish knitting this cardigan today! And while I'm at it, maybe I should figure out what projects to tote along for the weekend. For those of you going, what knitting will you be bringing along? I wonder if I will even have the chance to knit at all? Sometimes at knitterly events I get so excited, so worked up, so caught up in the moment that I completely forget that I even have my knitting with me, let alone take a second to rest. Hmmm...maybe I should wind up some yummy self-striping and knit on some plain vanilla, afterthought heel socks? What do you think?